With Nintendo's stock predictably cratering after its recent wild rise, investors would do well to reexamine some timeless investing wisdom from one of the all-time greats. After its stock quickly soared to clearly unsustainable heights, the Pokemon Go-fueled hot air appears to be rushing out of Nintendo (NASDAQOTH:NTDOY) (NASDAQOTH:NTDOF). As many in the investing community noted, this reversal of course could easily be spotted from a mile away. It's also a painful (for some) reminder of timeless investing principles that apply even to the seemingly irrational world of tech investing. Let's take a look. As the saying goes, "What goes up must come down" -- an adage perfectly embodied by Nintendo stock's trading this July. Released to unexpected acclaim, Pokemon Go's initial rollout across the U.S., Australia, and New Zealand took the tech world by storm. As the first mobile game to truly nail augmented reality-based gameplay, the game's achievements and the brief cultural phenomenon it sparked are sure to secure a place somewhere in tech history. In the wake of its release earlier this month, the app smashed download records for Apple's and Alphabet's app stores. The app needed just a single day to soar to become the top grossing app in Apple's App Store, halving the previous record held by SuperCell's Clash of Clans franchise game Clash Royale. Pokemon Go accomplished the same task in the Google Play store in just four days. From there, Pokemon Go continued its torrent adoption rates. Earlier this week, the app became the fastest ever to reach 50 million downloads, taking just 19 days to achieve this remarkable feat. The resultant boom -- and more recent bust -- in Nintendo's stock price has been well-documented, as seen in the above chart. Though its sell-off began the day prior, Nintendo's stock price cratered after the company issued guidance to investors, saying, "Taking the current situation into consideration, the Company is not modifying the consolidated financial forecast for now." That's a lot of corporate-speak, but in plain English, Nintendo simply reminded frenzied investors bidding up its shares that Pokemon Go's likely financial impact will prove far less potent than the upward swing in its shares suggests. The rise and fall of Pokemon Go contains a deeper financial lesson, one that most of us understand in the abstract but can fail to implement in our investing lives: Don't chase fads. True, we often advocate Peter Lynch-style investing here at the Fool. 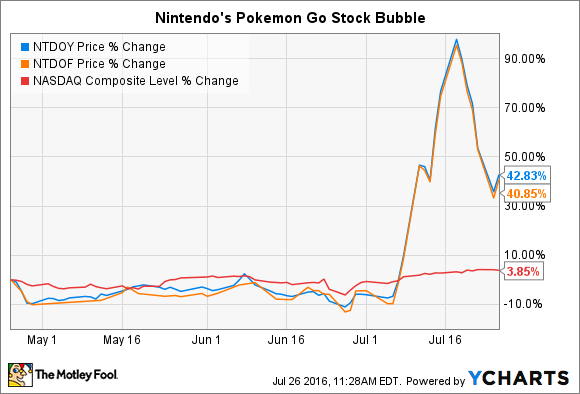 However, the Pokemon Go bubble in Nintendo stock helps highlight an absolutely critical distinction between chasing the latest fad and investing in real, growing businesses to participate in their expansion over the long term. As Lynch himself put it, "Investing without research is like playing stud poker and never looking at the cards." The cardinal sin that investors trading in Nintendo shares committed didn't lie in their correctly recognizing Pokemon Go as one of the most successful games in recent memory. Rather, their downfall came from failing to connect whether Pokemon Go's blistering success would translate into an equivalent financial success for Nintendo's shares. Already in the midst of a strategic shift toward mobile gaming, Nintendo's comments on its financial expectations clearly showed that games like Pokemon Go would foster some growth. However, even after accounting for the mostly unexpected success of the app, any investor with rudimentary research skills and a little curiosity could determine that the game stood absolutely no chance of supporting the doubling of Nintendo's multi-billion market cap that played out in the market in recent weeks. Unfortunately, this is just the latest example of investors' -- at least those buying in recently -- getting burned by not taking the time to connect a winning product with a winning investing idea. So the next time you or someone you know feels the temptation to pile headlong into the next investment craze, step back and repeat after me, "Remember Pokemon Go."